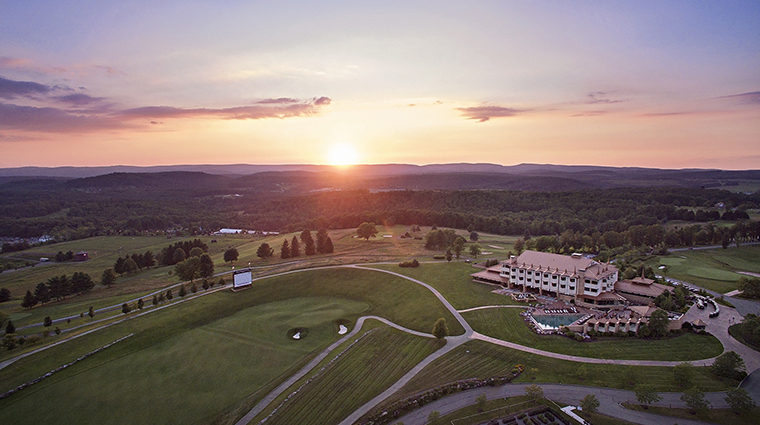 Aqueous is one of several restaurants located at Nemacolin Woodlands Resort, a sprawling 2,000-acre complex with numerous upscale accommodations, multiple dining venues, an enormous spa, and much, much more in the Laurel Highlands of Southwestern Pennsylvania. Located in the 42-room Frank Lloyd Wright-themed boutique hotel Falling Rock (which was inspired by nearby Fallingwater, one of Wright’s most renowned architectural works), the restaurant specializes in beef, from 17-day dry-aged filet mignons to bone-in Kansas City steaks, but there are plenty of seafood and vegetarian options as well. 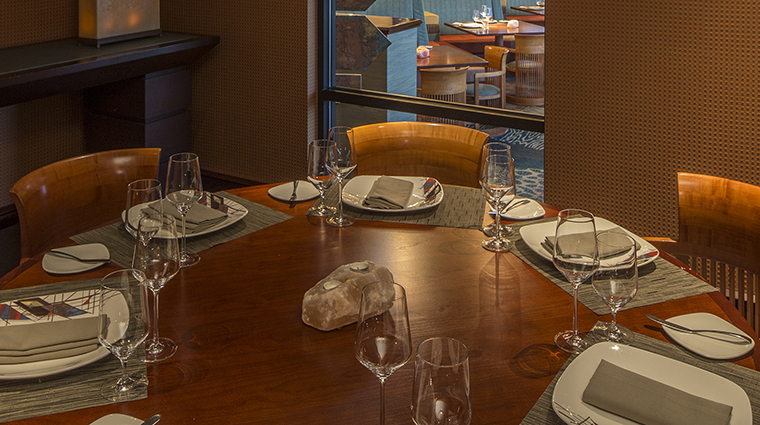 And unlike a lot of steakhouses, Aqueous is family friendly, with a menu just for kids. Unlike many traditional steakhouses, Aqueous does its own in-house dry aging and on-site cutting. Start with the crab two ways, a Maryland-style crab cake and a fresh cold crab salad. Beef is the star here. There is a plethora of enticing choices, but you can’t go wrong with the 17-day-aged filet mignon, cooked to juicy perfection. Don’t be surprised when you don’t see a steak knife on the table. Servers instead present a choice of four knives tableside for you to choose. The handmade knives vary in shape and style and come from the Williams Knife Company in Greenville, South Carolina. Ask for the sommelier’s recommendations for wine pairings. The resort is home to an excellent and extensive 21,000-bottle cellar. 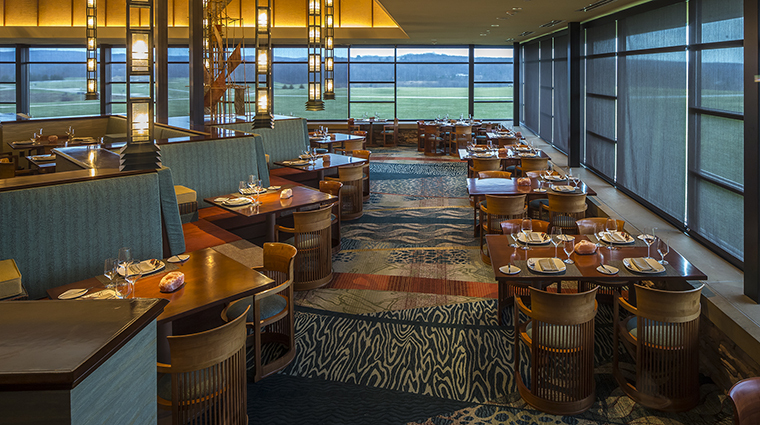 Ask for a table by the windows so you can take in the stunning views of the Laurel Highlands, as well as the 18th hole of the Pete Dye-designed Mystic Rock golf course. Make time before or after dinner to pop into Chateau Lafayette (a quick ride away, via a complimentary shuttle) to check out the resort’s amazing multimillion-dollar art collection, including 14 Tiffany floor and table lamps and works by Alexander Calder. Aqueous is led by chef Patrick Duffy. If you’re looking for a special or rare liquor to sip with your dinner at Aqueous, you’re in luck: This steakhouse has a fine selection of single-malt scotches and cognacs. 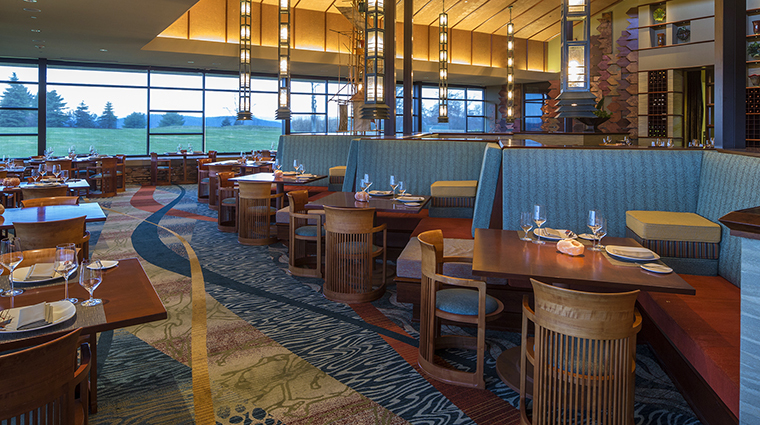 Aqueous has 84 seats, a nod to Joe Hardy III, the founder of the sprawling Nemacolin property. The billionaire owner first made his fortune with his company, 84 Lumber. Elements of Wright’s signature designs are incorporated throughout the restaurant. It’s fun to look for geometric patterns, natural stonework and other intricate details in everything from lampshades to chairs. 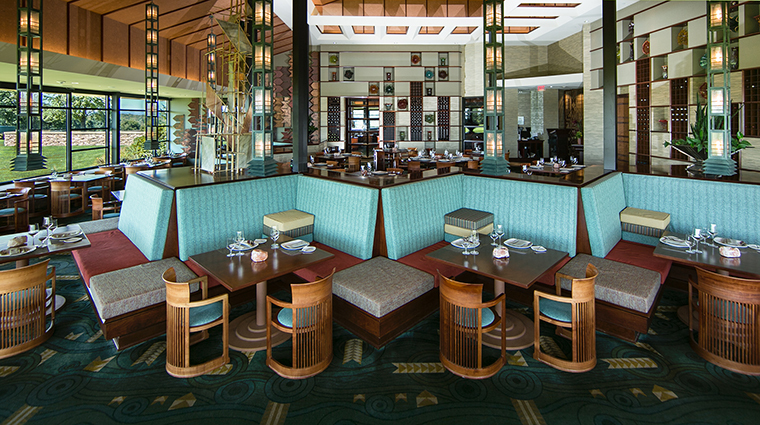 The table settings at Aqueous match the Pennsylvania restaurant’s geometrical, Frank Lloyd Wright-inspired décor. You’ll find a neutral woven place mat topped with very modern silver flatware and a napkin bundled by a silver holder at each setting. While the menu changes with the seasons four times a year, regulars can always count on the dry-aged steaks, plus favorites like lobster bisque, French onion soup and the Aqueous chopped salad year-round. The beef is a must here. The exacting menu gives you a plethora of well-explained temperature options. For example, the medium rare is red with a warm center, while medium arrives reddish pink with a hot middle. Choose everything from a bone-in Kansas City cut to a filet mignon. Gluten-free diners will love the special menu the restaurant designed just for them. There are even gluten-free desserts, like the Tropic Thunder, a dairy-free mango-coconut panna cotta topped with a gluten-free cookie. Local farms play a big role in what’s offered. For example, on the spring menu, the lamb comes from the Elysian Fields in Waynesburg and the chicken hails from Footprints in Gibbon Glade, both Pennsylvania farms.